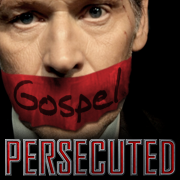 Persecuted is the new faith-based action thriller due to be released in theaters tomorrow, July 18th. Cinematically and artistically, the film is engaging and exciting. Christian evangelist John Luther refuses to support a sweeping religious reform, despite the urging of powerful political friends. When he won’t cooperate, these “friends” set him up to look like a murderer. Luther’s real “crime” is standing for biblical truth alone and not agreeing to accept all religions as equally valid. The situation he finds himself in, unfortunately, appears to be the direction the United States is heading if we do not work together to protect the First Amendment rights we now enjoy. Apparently, the film was designed for a crossover audience, an audience composed of both Christians and non-Christians. I believe the producers hope to reach moviegoers who would stay away from blatantly Christian, or so-called “preachy” films. God often uses tools like this as a stepping-stone to faith for people who would never enter a church or attend an event labeled “Christian.” At one time, I was one of them, so I can’t fault the filmmakers for trying to reach their audience in a way that could open the door to further discussions about true faith and our First Amendment rights. However, since the evangelist keeps talking about “the gospel,” I expected to hear the name of Jesus mentioned and perhaps an overview of the gospel message. Overall, this is a compelling movie, and I recommend it. Believers will find themselves challenged, especially during the final scene of the movie, to examine their own faith and ponder what they would do if someday they faced persecution for claiming the name of Christ. We interviewed Daniel Lusko, the producer of Persecuted on Heritage of Truth TV. You can view the interview here.